There is some truth to that, but that’s not the full story. To find some healing, I had to own my part in the creation of my experience. I knew who he was when I met him. He was the one who was safe and secure. He was also reserved and structured. He was the guy every parent would want their daughter to marry. I ignored the fact that there was very little spontaneity or passion in his life and in our relationship. I didn’t question the absence of those ingredients. I did what I was supposed to do, hid my heart, kept myself busy and distracted, kept myself from getting hurt. I made that trade-off and, to a certain degree, it served me. Let me say that again…It. Served. Me. I could stay hidden – making my life look picture-perfect – and in doing so, possibly avoid the judgment of others and being hurt by someone I might have really allowed into my heart. But every bit of that was my fears, my mask, and my choices. For me, in the end, it was still the right decision to release that marriage, but I wish I would have known everything I know today before I made that decision, because I would have handled things differently and certainly, more gently. Not as many people would have been hurt or impacted in the process. 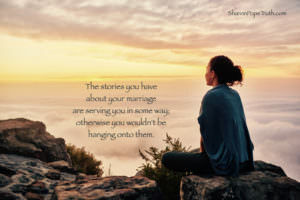 Are your stories about why your marriage isn’t working serving you in some way? Does it allow you to avoid the risk in being vulnerable with your husband because you’re afraid he might reject you or hurt you? Does it allow you to hide behind the mask of the perfect marriage and the perfect family and what everyone else would be envious of, while you can stay in your safe, small box? What are the stories you’re telling about your marriage? And how are those beliefs serving you? If you’re struggling in a marriage that feels safe and secure and you know you should be happy but somehow aren’t, it’s time to dive deeper into your role in the creation of this experience and determine whether you can find a way to be happy and fulfilled, connected and loving again in this marriage.